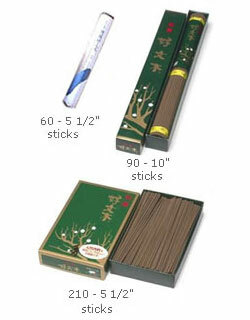 Excellent Kobunboku is an Aloeswood, sandalwood and herbal incense, great for meditation practice and mental clarity. This is one of our best selling Baieido incenses. Excellent Kobunboku blends Sandalwood with a hint of Aloeswood from Kalimantan. Used throughout history at nearly every religious ceremony and by Ayurvedic, Tibetan and Chinese physicians. Excellent Kobunboku is an Aloeswood, sandalwood and herbal incense, great for meditation practice and mental clarity. This is one of our best selling baiedo incenses. Excellent Kobunboku blends Sandalwood with a hint of Aloeswood from Kalimantan. Used throughout history at nearly every religious ceremony and by Ayurvedic, Tibetan and Chinese physicians. The translation for Kobunboku is "Plum Blossom". The Japanese word "Ko" means Nice, "Bun" means Elegant, "Boku" means Wood or Tree. The name refers to the cherished Plum Blossom Tree, otherwise known as "The Flower of Peace" in China. The blossoms of the Plum Tree have long been an essential ingredient in Japanese incense, particularly Baieido incense. Package comes labeled as "Special Plum Blossom, Tokusen Kobunboku"
Oh My, I'm Addicted to this Incense! Oh, I truly love this incense. The scent is intoxicating, yet soft and smooth. And it lingers in a room for hours after it has gone out. I have lit some in my room before bed and the scent remained all the next day! I will be buying more of this one.